superdumb supervillain: Protect-a-Bub this summer! Protect-a-Bub makes all sorts of cool stuff to protect kids from the harsh rays of the sun or the cold chill of winter. From sun protective swimwear to stroller accessories, sunglasses, and hats, Protect-a-Bub has your kid covered! The "Paint Your Own" UPF50+ Sun Hat is a craft project as well as protective gear. 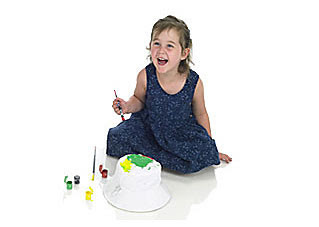 The floppy white bucket hat comes with brushes and paints, ready to be customized by little artists. 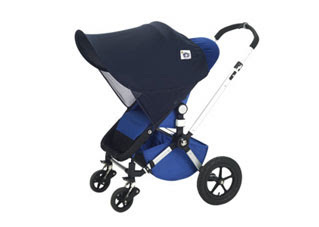 The UPF 50+ Classic Single, Twin, Tandem & Triple Stroller Sunshade Attachment fits most strollers and provides improved sun protection while retaining full air circulation. Use code protect4spring for 10% off your Protect-a-Bub online purchase! The sun hat is such a cute idea; my girlfriends little girl refuses to wear a sun hat and yet I can imagine how spending an afternoon (or at least 10 minutes) creating her own may entice her into wearing it. I may just go check it out; thanks!